A hero, to me, is someone who faces tough challenges with both courage and joy, and refuses to look away. Over Reunion Weekend earlier this summer, I met my newest hero. This new hero is Corey Reich, and he graduated in 2008. There were times that Corey wasn’t so sure that he would be back to Middlebury to celebrate his 10th Reunion with his friends. That’s because during his junior year in college, he was diagnosed with amyotrophic lateral sclerosis (ALS)—the progressive neurodegenerative disease also known as Lou Gehrig’s disease. ALS has a life expectancy after diagnosis of two to five years, and Corey’s doctors advised him against returning to school. But with true Middlebury spirit, Corey came back, finished his senior year, and graduated with his class. He then returned to his hometown of Piedmont, California, and became a passionate fundraiser for ALS research and a spokesperson for the Young Faces of ALS. Corey and his family have so far raised both awareness and more than $8 million for the ALS Therapy Development Institute. He’s channeled his passion for baseball and beer by raising money through related events, and he’s spearheaded the Young Faces of ALS National Corntoss Challenge. Corey has also been the assistant coach of the boys’ and girls’ tennis teams at Piedmont, his former high school, for the past 10 years. I got to spend some time with Corey at Reunion when we honored him with an Alumni Achievement Award, and I quickly understood the depths of courage and joy that he possesses. The thunderous applause by which his classmates, family, and friends celebrated this honor indicated that Corey is not my hero alone. My time with Corey was one of many extraordinary moments at Reunion over that gorgeous early June weekend. 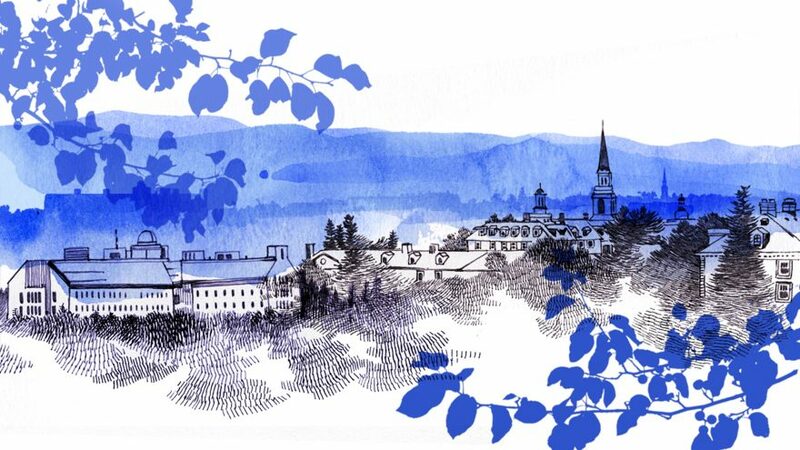 It was the kind of blue-sky, green-grass, fresh-breezes weekend that makes Vermont in the summer so utterly pleasurable, and being part of the Middlebury community all the more rewarding. On Saturday evening, in the white tents behind the Mahaney Center for the Arts filled with returning alumni, I met more than 75 years’ worth of courageous, joyful Middlebury graduates. To the Class of 2013: I think that my two Great Pyrenees, Padma and Suka, were ready to stay with you the rest of the night. Before the class receptions, I took a walk down the aisle of Mead Chapel with my two new friends, Dumont Rush and Stu Walker, both Class of 1943 and back on campus for their 75th Reunion. Ninety-six-year-old Dumont is a Navy veteran who graduated from both MIT and Middlebury and had an extraordinary career as a nuclear scientist. Now, with his wife Peggy, he’s an active member of the greater Middlebury community. Stu Walker, 95, is also a veteran; a former professor of pediatrics and chief of pediatrics at Mercy Hospital in Baltimore; an Olympic yachtsman who competed in the 1968 games; and a competitive sailor who only retired from the sport two years ago (yes, you read that right). When I asked him when his last sail was, he told me it was only last month. He came with his wife Patricia, whom he married just five years ago. As I walked arm-in-arm with Stu and Dumont, I thought about the nearly 100 years of life fully lived each of these remarkable men represented. Both worked courageously to improve the lives of others in their careers and have joyfully pursued their passions for decades. I can’t think of two better examples of Middlebury energy and creativity. Such lives are an essential part of what it means to be Middlebury. Reunion comes just two weeks after Commencement, where we celebrated the achievements of the Class of 2018, including six Fulbright Scholarship recipients, three Watson Fellows, and a Charles B. Rangel International Affairs Fellow. Toni Cross ’18, the Rangel Fellow, has had a passion for languages since she was a child and currently speaks Modern Standard Arabic, Moroccan Arabic, French, Russian, and Spanish. This fellowship will prepare her for a career in the Foreign Service—her intended path since she was 11 years old. Toni and her 2018 classmates joined the ranks of Middlebury alumni on May 27. I did two weeks later. Dan Elish and Maria Padian closed their class history by officially adopting me into the Middlebury Class of 1983—a great surprise and honor! I encourage you to find a hero to honor, a role model or two to emulate, and an opportunity to invite a new friend into your circle this summer. Carry forward this spirit of Reunion, where Middlebury’s values of rigor, resilience, openness, connectedness, and caring were on full display.